From a book entitled In Vogue, by Georgina Howell, which includes photos from over 60 years of British Vogue. Left to right, top, designs by Jenny, Doucet, Drecoll. Bottom left, Cathleen Nesbitt in an Egyptian brocade gown "with a Nile green georgette underskirt." Bottom right, a blouse with hieroglyphic-inspired patterns. 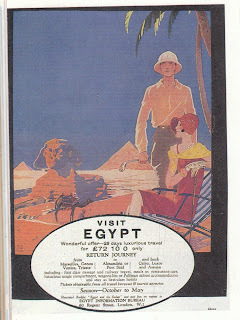 An advertisement from October 1929, British Vogue. A scarab brooch; German silver and cloissone. 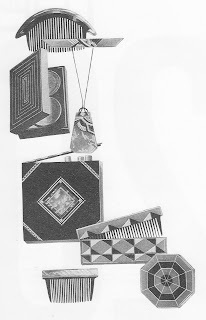 Egyptian-inspired accessories: combs, compact, cigarette case, pendant. This flowing, pleated gown seemed Egyptian-inspired to me, but I was wrong. Actually, it's supposed to be Greek-inspired. This is a blue-gray satin gown by Mariano Fortuny. Anyhow, it's ancient-inspired!